The aroma diffusers are used to help get essential oils into the air faster and spread it in the room better. This enables you to use them as you breathe in the wonderful aromas. Aromatherapy diffusers come is many different shapes, colors and styles, and you will find that some will require either an open flame or electricity to work well. Let's see what we can learn about aroma diffusers and how they will increase your enjoyment of your essential oils collection! Like a usual nebulizer this device allows the essential oils to get dispersed as molecul and carried by the air so the spreading will be easier. Also this is used in therapies where the oil use for inhalation to alleviate pain, affect one's psyche and or mind in general. An Electric Oil Diffuser will allow you the ability to create many fantastic scents and expand them into the air that is throughout your home. Some of electric oil diffuser you can choose from: Spa scenter, scentball, car freshener, and fan diffusers. There are many type of aromatherapy oil diffuser, but if you have children or pets maybe these 2 type of oil diffuser is the one that you are looking for. Aromatherapy night light can be added to your aromatherapy oil diffuser collection. It has a function as a night lamp, fragrance diffuser, and also as an air cleanser. Works best in bathroom or bedroom. The essence of plants may be experienced throughout the day in a scent releasing by aromatherapy jewelery. Wearing a jewelery with your favorite scent is a good way of promoting good health, and can help lift your mood all day. It is a fun and very easy way to enjoy aromatherapy. 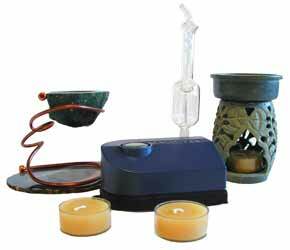 This type of aroma diffuser is normally what is preferred and best suited for starters. This type may pose a risk of burns and fire but with proper usage this risk should be reduced greatly. This apparatus is simple that which is normally made of either glass, steel or ceramic. The oil is heated on a higher platform just right above the source of heat that would normally be a candle. This is best fitted to enjoy nights with a special someone, what could be more romantic than that? Aromatherapy Air Fresheners is a quick way to freshen up your room. Simply add 5-10 drops of the essential oil of your choice to each ounce of water into a spray bottle. Shake well and use it to spray around the room as often as you need it. Remember to shake well before each new spray. Candles also prove to be wonderful aromatherapy diffusers. You can buy candle that already been laced with essential oils. Or light a candle to burn for a few minutes and then place a single drop of essential oil on the melted wax. You need to make sure that the droplet does to the wax and not the wick of the candle. You must be extremely careful because essential oils are flammable and only use them in a well ventilated area. Never doubt that aromatherapy can help reduce the skin problems naturally. Using the right aromatherapy diffuser for skincare can give you more effective and efficiency in achieving more radiant skin. This diffuser is a portable device that allows you to do aromatherapy wherever and whenever you want to with a computer. All that needs to be done si to plug the device to the computer and place a drop of the desired scent and it is as good as being at home enjoying the same benefit. This product devise is excellent for people who smokes and would like to keep that bad odor off of their car. Also just for the need to freshen one's car this is the type of diffuser they are looking for. Suitable for people who just wants to bring with them the scent they love so much wherever they go or while their driving. Aromatherapy Inhaler, also known as nasal inhaler, is one of aroma diffusers that is compact and portable and it can be used at work, in car, schools, airplanes and all public places. How to use aromatherapy for hot tubs correctly, see what are essential oils for hot tubs and what are the uses.